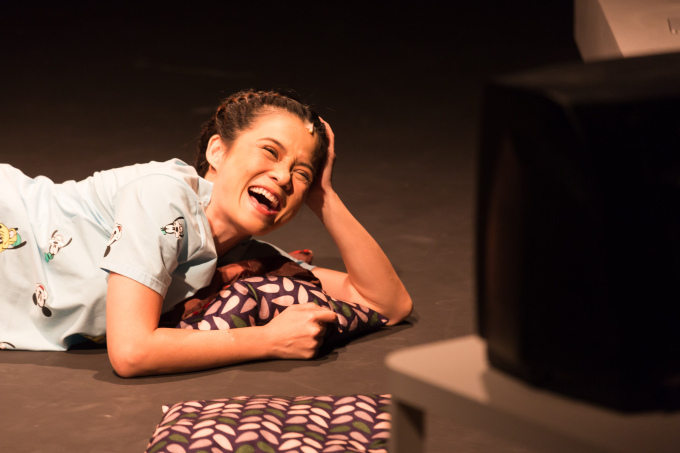 Actor, Forty is a meeting of strengths for award-winning actress Yeo Yann Yann and The Necessary Stage team. Having worked together many times in the past, Yeo reunites with TNS for a unique collaboration, returning to her lesser known roots as a thespian. Taking Yeo’s life and career as a starting point, resident playwright Haresh Sharma has crafted a monologue that sparkles with its linguistic diversity and rich characterisation. “I tried to make it as challenging (for Yeo) as possible,” said Sharma in the post-show dialogue, without meaning to tease. One needed only to look across the panel, to a somewhat subdued Yeo, to guess that Sharma has succeeded in doing so. 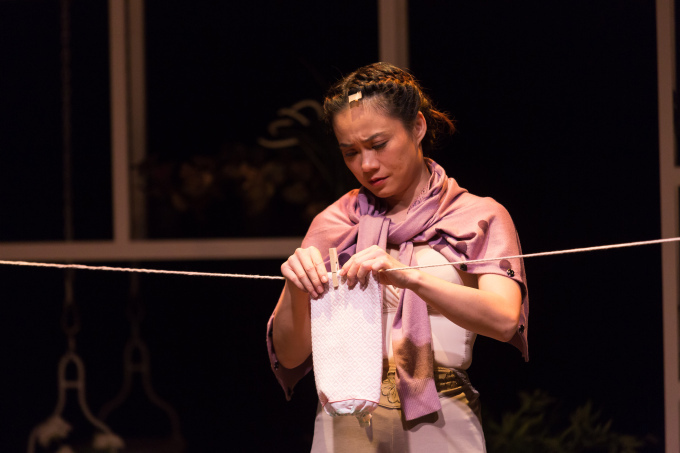 Yeo transports us into a world not unlike her own, of a passionate 40 year old Chinese actress chasing success in the region only to find out that she is pregnant in the midst of a big project. The monologue explores how, at such a pivotal moment in her life and career, the protagonist wrestles with the choice of who to be – woman or actress. For many followers of The Necessary Stage, this project is perhaps reminiscent of Best Of, Sharma’s one-woman monologue featuring the acclaimed Siti Khalijah. Actor, Forty, however, comes across as larger-than-life and considerably more ambitious, at least in its scope. While Best Of traces the life and encounters of a young Malay-Muslim woman over the course of a day, Actor, Forty examines a Malaysian-Chinese actress’ journey from lofty aspirations to worldly success, from TV romances to real-life pregnancy, from actress to mother – within roughly the same amount of time. The sheer number of characters that Yeo takes on, aside from that of the protagonist, is also a clear indicator that Sharma was keen on pushing her to her limits. And it is with incredible skill and focus that Yeo carries the act and shines through over an hour of inner turmoil and outer shape-shifting. What happens when your character is written ostensibly as a patchwork of quotations, intertextual references and anecdotes? Yeo shared with us that “finding her (character) was the hardest part” and it became a role all the more difficult to play because of the sometimes minute differences between the character’s perspectives and her own. The monologue also seemed to present evidence of occupational hazard: when one’s job as an actor is to tell stories, it is perhaps not inconceivable that the sense of one’s own story easily gets lost amongst the many lives of the characters one has portrayed. Yet with her tireless references to Wong Kar-Wai’s Chungking Express, Kuo Pao Kun’s Mama Looking for Her Cat and other fictional worlds newly invented by Sharma, it struck me that Yeo’s character might be best at revealing herself when playing out the stories of others, much like how what plays out onstage can sometimes seem truer than life itself. Will she then embrace the role of a mother? “No one is going to write you a review for being a good mother,” she says at one point in the play. While Yeo’s character firmly takes the foreground, I found the discreet presence of the two stage assistants (played by April Kong and Muhammad Shafiq Haziq) an apt allusion to the people who work in the dark to make the acting careers, like those of Yeo’s and her character’s, possible. As opposed to the sparer model of a one-woman and single chair set in Best Of, the wide-ranging narrative of Actor, Forty benefits from Kok Heng Leun’s beautiful monochromatic set and the fluid use of space which has its alterations, as well as Yeo’s many costume changes, attended to by her two stage assistants. Alvin Tan’s integration of these seemingly extraneous agents brings much needed relief (comic and otherwise) for the audience whilst it also smoothens the transitions in an often tense and fragmentary unraveling of the main narrative. The phrase “天时,地利,人和” (roughly meaning ‘Right time, Right place, Right people’) perhaps best sums up the success of Actor, Forty. Whether it was dramaturg Melissa Lim’s filmic recommendations to Sharma, Dr Quah Sy Ren’s Mandarin translations or Julian Wong’s well-informed sound design, The Necessary Stage’s discerning efforts at assembling the right team has certainly paid off in this crossover production, and Yeo Yann Yann once again proves herself as one of the best local actors, a theatre tour de force commandeering an entire stage by herself. By Nigel Choo for Bakchormeeboy. Photo Credit: Ruey Loon.